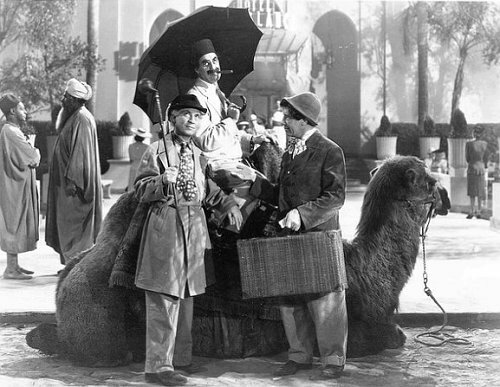 Groucho: What do you do with your camels? How do you rent them? By the hour? Chico: I just fill them up with water and they go for eight days. Groucho: What do you feed them? Chico: Peanuts - it's the healthiest food in the world. Groucho: How do you know? Chico: I was a monkey for three years. Groucho: It's been longer than that. By the way, what are your rates? Chico: Twenty francs for a camel with two humps, and ten francs for a camel with one hump. Groucho: What do you charge for a camel with no humps? Chico: A camel with no humps is a horse. I gotta horse too, but the horse has a bump. Groucho: If I could get back down there I'd go that way. Chico: Don't worry about the price, Boss. Whatever you got - I take.